What the what? Come for the chicken, stay for the unlimited Dole Whips. That's the motto of the chicken place that is part of the chain that seems to have sprung up overnight with locations all over the place. 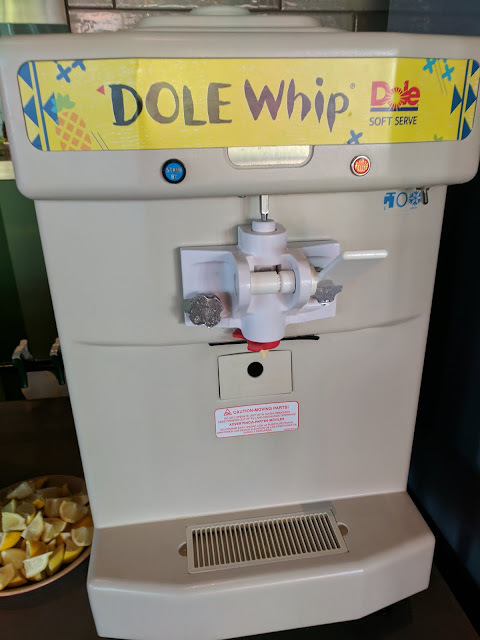 I've been to two locations in the loop and neither had this Dole Whip machine, but Nat sniffed it out in the newish food court/food hall that Oak Brook built upstairs in the mall by the new theatre. I've written about Dole Whips before. There's the time that I compared the sight of a set of Dole Whips at the Polynesian to the time when Rudy's Dad first laid eyes on Notre Dame Stadium. Then there was the time when a guy who runs a Yogurt store in Glen Ellyn reached out to tell us that they were carrying Dole Whips. They have one of those fancy customizable Coke machines with dozens of drinks and flavors but after poking around on the machine, I think I figured out that they don't have any pineapple juice or pineapple flavored sodas like Fanta, so as for floats, we were out of luck. The consistency isn't perfect, but it is still a Dole Whip. Need your fix? Head to Oak Brook.